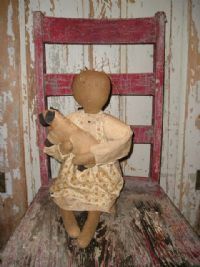 This is another Spring time doll with her little sheep. She is wearing a grungy yellow dress with a flowered apron. 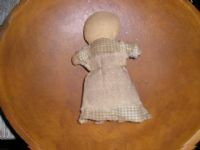 This little prairie doll is so sweet, she is 7", and wearing a grungy tan check homespun dress and osnaburg apron with tie. 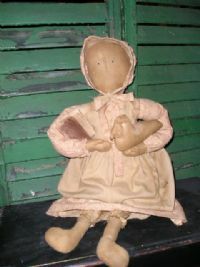 So simple in her flowered dress with bonnet and muslin apron with bloomers. She has in her arm her grungy book and her muslin duck. Weighed to sit 16" tall. So sweet! 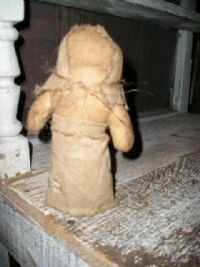 and a must have for your home is this Muslin wee prairie doll in a grungy osnaburg apron and kerchief. Stands 7 1/2"
This is Emma. 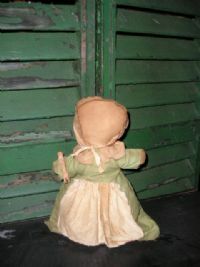 She is wearing a grungy celery colored dress with muslin apron and kerchief. Emma is 10 1/2" tall. Weighed to stand.